An accessible account of Evo Morales’s first six years in office, offering analysis of major issues as well as interviews with a wide variety of people, resulting in a valuable primer on Bolivia and Morales’s “process of change”. In this compelling and comprehensive look at the rise of Evo Morales and Bolivia’s Movimiento al Socialismo (MAS), Linda Farthing and Benjamin Kohl offer a thoughtful evaluation of the transformations ushered in by the western hemisphere’s first contemporary indigenous president. Accessible to all readers, Evo’s Bolivia not only charts Evo’s rise to power but also offers a history of and context for the MAS revolution’s place in the rising “pink tide” of the political left. 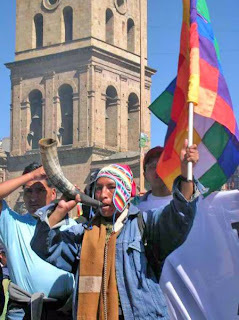 Farthing and Kohl examine the many social movements whose agendas have set the political climate in Bolivia and describe the difficult conditions the administration inherited. They evaluate the results of Evo’s policies by examining a variety of measures, including poverty; health care and education reform; natural resources and development; and women’s, indigenous, and minority rights. Weighing the positive with the negative, the authors offer a balanced assessment of the results and shortcomings of the first six years of the Morales administration.